There’s no doubt about it – having the best omelette pan will also allow you to make the best omelettes. Omelette (or omelet) is a delicious meal, especially for breakfast. Some of its variations include the frittata and Japanese omelette. Since omelette is not just a regular scrambled egg recipe (which is easier to cook), it requires some skill. But of course, constant practicing will eventually result in more perfect-looking omelettes. 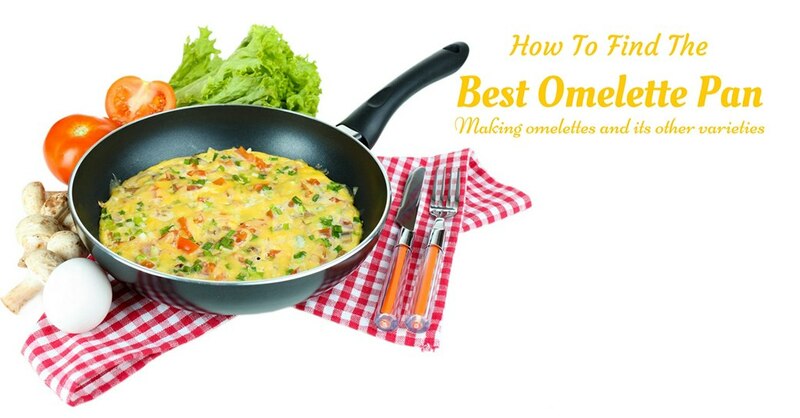 In this article, I will review 10 omelette pans to help you with your buying decision. 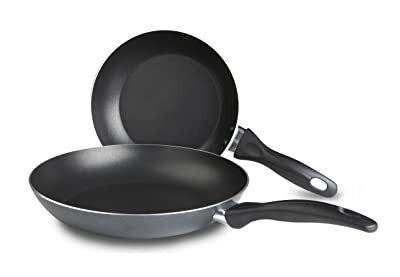 You will see regular frying pans and skillets (which are basically the same) and the best cooking pans in the list because they can effectively cook omelettes. I will also present you with special cookware (omelet pans best rated) that are especially intended for making omelettes and its other varieties. Which is the Best Omelette Pan to Go For? The bottom of the pan – Check the bottom of the pan. Having a flat bottom ensures even distribution of heat (this is very much needed in making an omelette). It’s also wise to choose a pan with a thick bottom as this will prevent warping in high heat. However, if you’re only going to use the pan for making the omelette, this feature is not that important because omelettes are only cooked over medium heat. Shape – Having sloping sides (which is typical on frying pans and skillets) is important as omelettes need to slide onto a plate. Getting the best frying pan will work for this purpose. Size – Choose a size that will fit into your cooking needs. Pans that are 7 to 8 inches in diameter are ideal for making small omelettes (for 1 to 2 persons). 10 to 12-inch pans, on the other hand, are ideal for making large omelettes (suitable for sharing and large meal preparations). Handle – Having a comfortable handle will allow you to easily maneuver your omelette while cooking. It’s also important to have stay-cool handles so that you won’t need a pot holder to hold on to the pan. Surface – Nonstick surface is ideal for making omelettes. Otherwise, your omelettes can get ruined as you flip it (presentation is important in an omelette). Note that having an aluminum base allows for quick and even distribution of heat (great for all-around cooking). However, aluminum is not metal, so it won’t work on an induction stove. It’s wiser to choose pans with nonstick coatings that are chemical free, especially if you’re going to use the pan for making other recipes. You see, the toxic elements in nonstick coatings are only released when exposed to high heat – and you only cook omelettes in medium heat. Use silicone utensils only. Don’t use plastic utensils that can melt into your food. Don’t use sharp metals even if the manufacturer says the product is scratch-resistant. Hand washes with warm soapy water even if the unit is dishwasher safe. Turn on the stove to low heat. When the pan is already heated, pour in the beaten egg mixture. 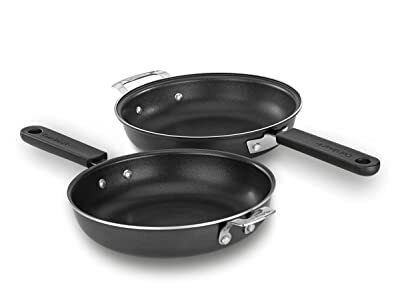 Interlocking Design – While this pan works as a Frittata and Omelette pan as is, the 2 interlocking pans can be separated and used individually. I like the design of this multi-purpose omelette pan. Aside from omelette and frittata, you can also use the pans for other recipes and dishes. Materials – It’s made of aluminum materials, but the bottom is made of stainless steel. 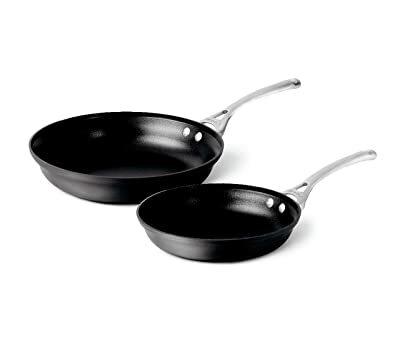 Dupont Teflon Nonstick Coating – The nonstick coating is PFOA-free. Design – The slope shape design makes it easy to flip omelettes, pancakes, and sandwiches. Capacity – It can easily make a 2 or 3-egg omelettes. Cleaning Procedure – You can wash it by hand. Because of its size, it can only make small omelettes. This model of omelette pan may be small, but it can prepare omelettes (and other recipes) for 2 people. Its size and shape also allow you to make Japanese rolled omelette (video). The Nordic Ware omelette pan is a folding pan. It’s available in black and silver (combination) color. 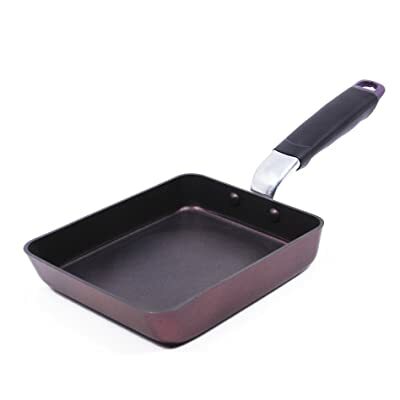 NonStick Coating – It comes with PFOA-free nonstick coating for quick release of food. Materials – It’s mainly made of stainless steel. Aluminum Bottom – Its base is made of aluminum for even distribution of heat. Cleaning Procedure – The manufacturer specifically says that it’s not dishwasher safe. Use soap, water, and sponge to clean it. It comes with a long handle for a more convenient cooking. The handle doesn’t get hot during cooking. The folding pans are well lined up. It’s spacious enough to handle 5 eggs when making omelettes. You can’t use it on an induction stove because the base is made of aluminum. While the long handle stays cool during cooking, the small round handle near the opening can get really hot. I really like the design of this omelette and frittata pan. It can be used on the stove and in the oven, so it’s really a multipurpose cooking pan. 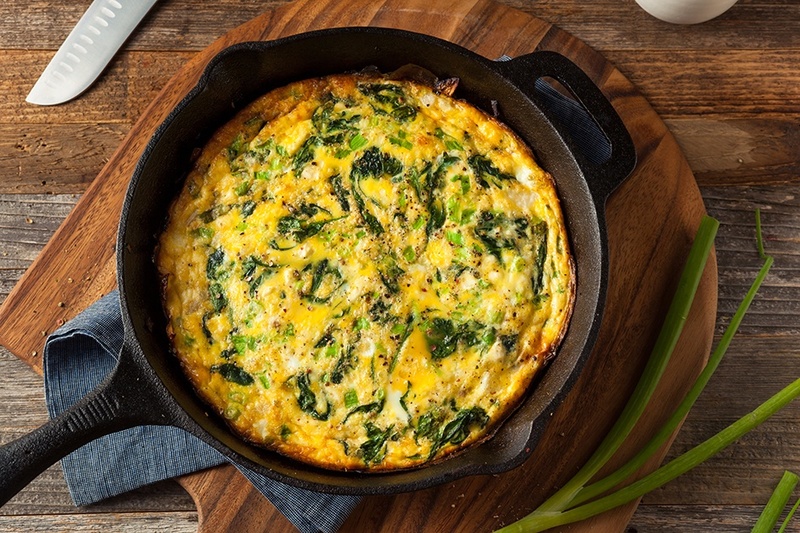 And because of its unique design, you can make perfect omelettes and frittatas like an expert. The Lodge L5SK3 is a skillet that can be used as an omelet pan. You can get it in black color. 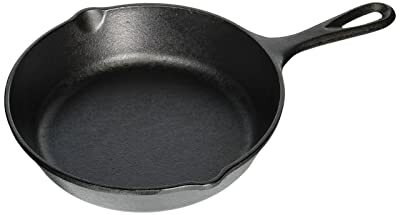 Materials – This is a cast iron omelette pan. Pre-Seasoned – It’s ready to use right out of the box. Design – It’s designed to retain heat for quick and even cooking. Cleaning Procedure – It’s not dishwasher safe, so wash only by hands. For best results, wash with hot soapy water and pat dry. Cast iron is durable, this skillet will last for a long time. It’s a multipurpose cookware – it can cook other recipes aside from omelette. Cast iron is not easy to maintain – it even needs to be seasoned regularly. I like this all-around cooking pan. Aside from omelette, you can also use it to fry, saute, and bake. Cast iron cookware can also be used on induction stoves, gas stoves, grills, open fires, etc. Interior Design – The interior is lined with 3 layers of nonstick coating. Handle Design – The pans come with stay cool handles. Cleaning Procedure – The pans are dishwasher safe. However, washing them by hands is still the best (to prolong the life of the nonstick coating). Its heavy-duty construction ensures you that you can use it for many years. It can’t be used on an induction stove. When you get this model of omelette pan, you get 2 pieces of frying pans in 2 sizes. 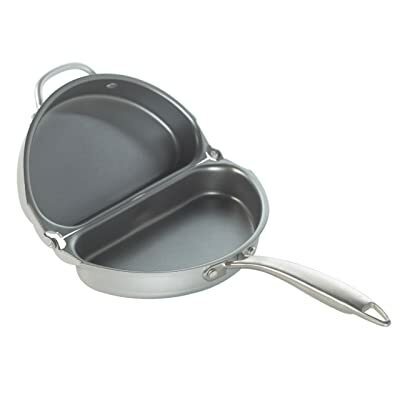 You can make small and large omelettes with these pans and cook other dishes in them as well. This Ozeri omelette pan is an 8-inch model. You can get it in stainless steel color. NonStick Coating – The Eterna nonstick coating is PFOA-free and APEO-free. Scratch Resistant Technology – It’s tough on scratches. Handle Design – The handle is comfortable on the hands and heat resistant. Cleaning Procedure – While it’s dishwasher safe, you can also rinse it by hand and wipe with paper towel to dry (this will prolong the life of the nonstick coating). It can be used on induction cooktops and other types of stoves. Except for being quite heavy, this is a good frying pan. It is also the right size for making a regular size omelette. This Cuisinart omelette pan is a 7-inch skillet. It’s available in black and silver (combination) color. Materials – It comes with an aluminum base to ensure quick and even heating (no hot spots). NonStick Coating – The nonstick coating is made of Titanium materials. Handle Design – The handle is made of stainless steel, it provides solid grip and will remain cool even while cooking. Cleaning Procedure – This model is dishwasher safe, but it’s still better to wash it by hands. You can cook omelettes without sticking. It’s a good size of frying pan for making the omelette. It comes in a solid construction. Because of the aluminum base, it can’t be used on an induction stove. This T-Fal omelette pan is a 12.5-inch frying pan. It’s available in black color. 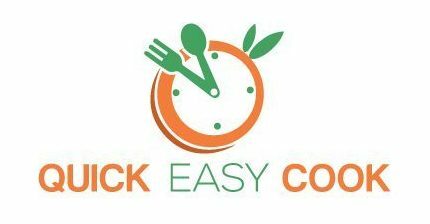 Patented ThermoSpot Design – This is a heat indicator, and it tells you when the pan is already hot and ready to be used for cooking. Scratch Resistant Technology – Even metal utensils won’t scratch the surface of the nonstick coating. Materials – The main pan is made of aluminum materials and the base is made of stainless steel. Cleaning Procedure – It’s dishwasher safe, but the nonstick coating will last longer if you hand wash it. You can use it on an induction cooktop. The handle stays cool even when cooking. There’s a “hump” in the middle of the pan – because of this, liquid and soft foods tend to drip to the sides of the pan. While the thermospot is a good feature, it somehow created a hump in the middle of the pan and made it a not-so-good omelette pan. This model would probably work better for searing and sautéing. 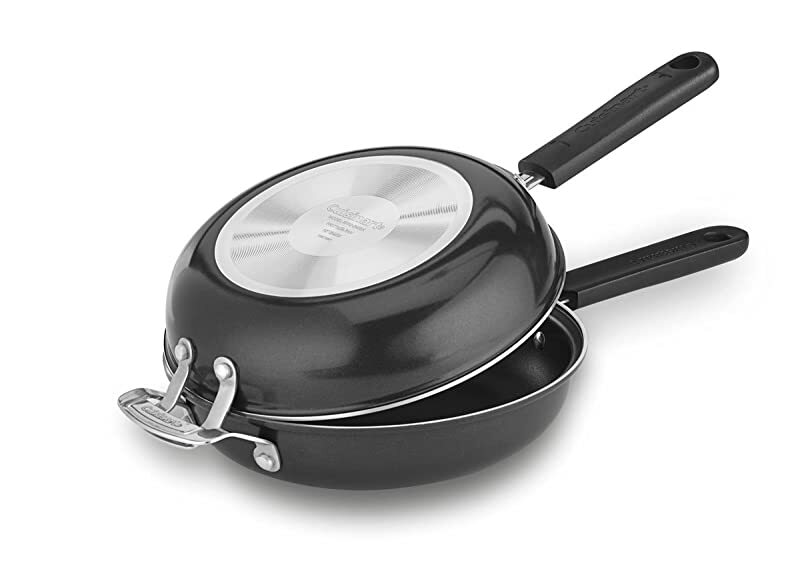 This is an omelette pan set from Calphalon – the package contains an 8-inch and a 10-inch pan. They’re available in black color. 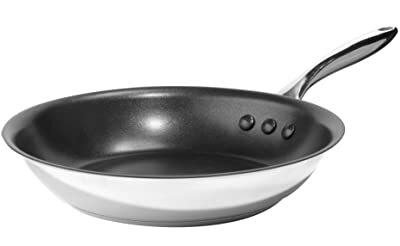 NonStick – The nonstick coating is PFOA-free. Design – The pans come with flat, wide bottoms for even heating. The handles on the pans don’t get hot. The pans are lightweight and easy to manage. 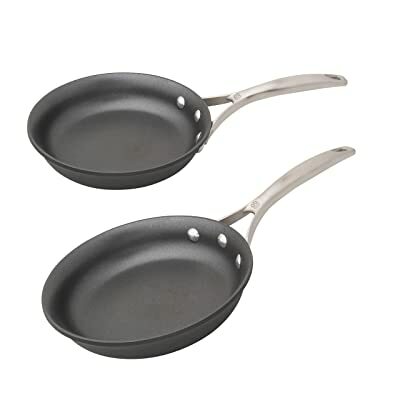 You have 2 pan sizes to choose from when making the omelette with these pans. You can also use them for making crepes, sandwiches, and other types of dishes. This T-Fal model is a cookware set that’s comprised of 2 omelette pans – an 8-inch and a 10-inch pan. They’re colored black and gray (combination). NonStick Coating – The nonstick coating is PFOA-free. Handle Design – The handles on the pan are ergonomically designed to be comfortable on the hands. Design – They’re made with flat bottoms for even distribution of heat. Cleaning Procedure – You can put the pans in the dishwasher, but it’s more advisable to just hand wash them. You can make omelettes and pancakes with the pans included in this package. Moreover, you have the option of using the large pan or the small pan for your recipes. You’ve seen the reviews of 10 different models of omelette pans. Have you made your choice yet? As you can see in the list, the Cuisinart FP2-24BK Frittata Nonstick Pan Set is my Top 1 choice. You get 2 pans with this model, and they can be interlocked for easy flipping of food. The only downside to this model is that the pans can’t be used on an induction cooktop. Now, if you’re particularly looking for a Japanese pan that can make Japanese rolled omelette, the TeChef - Tamagoyaki Japanese Omelette Pan would be a good choice. It’s light and easy to manage and it’s the right size for making omelettes (and other recipes) for 2 people. And yes, it can be used on an induction stove. Another great choice for an omelette pan is the Nordic Ware Italian Frittata and Omelette Pan. This folding pan is only about half the size of the Cuisinart model, making it easier to manage. Unfortunately, like the Cuisinart pans, it’s not induction-friendly. My last recommendation is the Lodge L5SK3 Cast Iron Skillet. It’s a multipurpose cast iron pan that’s also easy on the pocket. But yes, it’s quite heavy. If you’re particularly looking for an omelette pan that you can use on an induction stove, this is one of your best options. Let me know if I have helped you in reaching a decision as to which omelette pan to buy. The comment section is all yours, so just leave your message there. Also, don’t forget to share this post with other people who are also searching for the best omelette pan. I appreciate your concise writings.